Tony Romo, left, and Aaron Rodgers, right. Aaron Rodgers is widely known as one of, if not the, best quarterbacks in the NFL. He could end his career right now, and probably be a Hall of Famer. Everyone knows his ridiculous track record at Lambeau Field — 37-3 over his last 40 starts, 38 touchdown passes and zero interceptions since December 2012. You've heard it all. But you might be surprised, especially if you're one of those irrational haters of all things Tony Romo, that Sunday's game between the Packers and Cowboys will feature the two best quarterbacks over the course of the 2014 NFL season, and the proof is in the statistics. 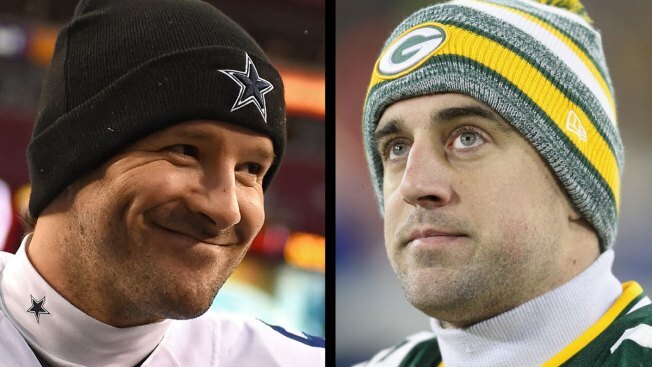 In fact, Romo actually edged out Rodgers for the passing efficiency title over the course of the regular season, finishing the year with a league-high 113.2 quarterback rating. Rodgers finished with a rating of 112.2. Rodgers threw for more yards, more TDs and fewer picks, but Romo missed one game after fracturing two bones in his back. Romo did lead in completion percentage, making good on 69.9 percent of his pass attempts. So if you want to see the best signal-callers in the league this weekend, don't bother watching the Broncos or the Patriots, just tune in on Sunday at noon, and you'll get your wish.